Open the Help menu in Rocview. Write some text in the Subject field (do not use special characters); For example: "Switch does not work". Optionally write some detailed information about your issue in the Description text area. A file explorer window will open with a file named issue.zip which can be attached in the Forum. 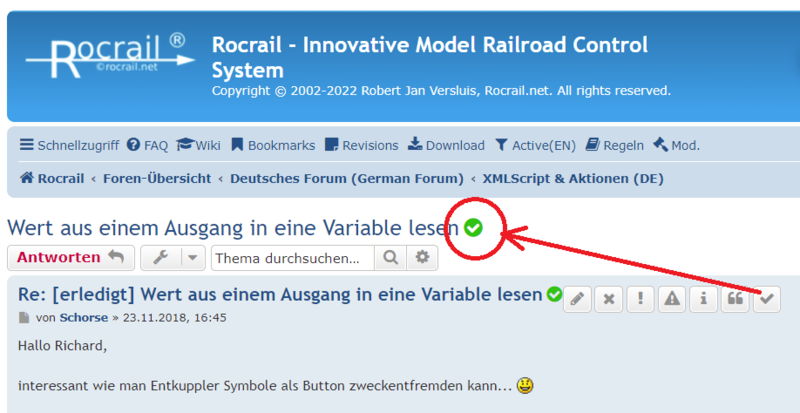 At the bottom of the Forum entry is a "Upload Attachment" feature, select the issue.zip file just created. If the zip file is not created automatically, then use a zip program to zip the "issue" subdirectory. 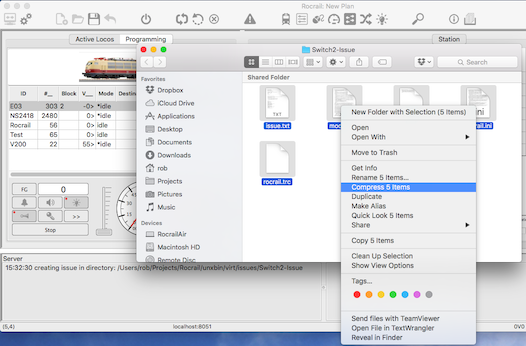 Creating an issue in case of a modular layout will flatten it into one plan file. Zipping the complete directory will be the better way for this type of layouts. Activate only server trace levels which are really necessary. Byte trace level makes only sense in case of communication issues. Automatic mode trace level makes only sense in case of automatic mode issues. Switch off all unnecessary trace levels. Prepare the environment as needed for reproduction of the issue. Make the reproduction of the issue as short as possible. Write in the Issue Dialog a step by step list on how to reproduce it. This issues folder is by default in the workspace environment but can be modified in the general Rocrail server settings. In the server trace window the fully qualified path will be shown. If the server runs on the same computer a file explorer window will be opened which contains all files which can be compressed into one file for uploading in to the forum. With newer revisions an issue.zip file is created automatically. Optional another path can be selected if the server runs on the same computer. 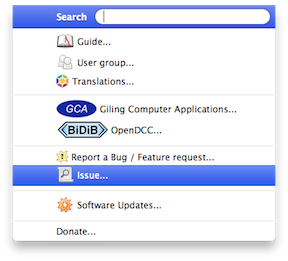 Compress the Issue directory into a 'issue'.zip file on Mac/Windows or into a 'issue'.tar.gz on Linux. Attach this 'issue' archive to the Forum posting. Do not use special characters in the subject because it is used for building a filename, which can be platform dependent. Optional path for storing the issue files in case the server runs on the same computer as Rocview. Short description of the issue. This is optional but highly recommended. issue.txt Content of issue dialog and statistics of server. occ.xml Memory dump of occupancy and placing. 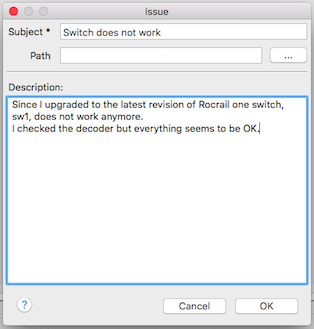 rocrail.trc Copy of current trace file(s). These files are contained in an "issues" sub-directory. At the bottom of the forum there is an option "Attachments". Select the file you want to place in the forum with the "Add files" option and then press "Submit". Ik heb al van alles geprobeerd maar zelfs met een zetje wilt de trein niet gaan rijden. V200 "Elektrolokomotive E 41 der DB"
E03 "Elektrolokomotive BR 103 der DB"
Just click on the solved button.